In the January/February issue of Foreign Affairs magazine, Mike Huckabee presents an essay about what he would do as president, with respect to foreign affairs (Huckabee, M.D. (2008). America's Priorities in the War on Terror: Islamists, Iraq, Iran, and Pakistan. Foreign Affairs, 87 (1), Jan/Feb. www.foreignaffairs.org). The essay is one of a series by 2008 presidential hopefuls. I have previously reviewed essays by Barack Obama, Mitt Romney, John Edwards, Rudolph Guliani, Hillary Clinton, John McCain, and Bill Richardson. I was surprised by Mike Huckabee’s robust, pugnacious, almost bellicose approach to international affairs. The main purpose of the essay seems to have been to project an image of strong Commander in Chief, and to that extent, the essay is successful. One would not expect a country preacher from Arkansas to suggest invasion of Pakistan, cutting off aid to Egypt, using “swift and surgical air strikes and commando raids” (mainly by the CIA) to eliminate terrorist cells, dramatically increasing the military budget to support the use of overwhelming military force. The trouble is, I didn’t find much of it convincing. It seemed to be an image-building piece, not a serious set of proposals. Why do I feel that way? Because the essay is just too single-mindedly narrow and bellicose, naïve in its presumptions, and self-contradictory in its assertions. Huckabee has clearly done some reading up on international affairs, but instead of presenting any thoughtful and nuanced analysis, decides to show only how ready he is to push the button. It’s just not credible. On the other hand, if it really is exactly Mike Huckabee’s actual views on international affairs, then the essay is frightening. So there you have it: Speak softly but carry a big stick. 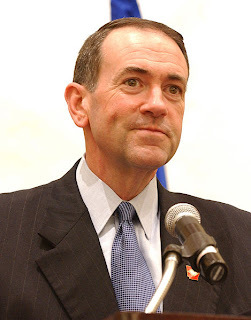 To his credit, Huckabee realizes that it is no good to export American values as if they were Coca-Cola. He acknowledges that moderate Islamic states may look more like benevolent oligarchies or tribal coalitions rather than constitutional democracies. That is a big contrast with other Republicans, such as McCain, Romney, and Guliani, and some Democrats, like Edwards and Clinton, who do not seem to understand that important subtlety. On the down side, Huckabee’s understanding of what has happened recently in Iraq seems pretty naïve to me. He thinks that “Sunni tribal leaders in Iraq have turned against al Qaeda to work with us; they could not stand the thought of living under such fundamentalism and brutality.” An alternative explanation is that we bought temporary Sunni loyalty by supplying guns and money. Who those guns will be pointed at in the future is unknown. Huckabee’s “Arab and Muslim policy” will be to find a course “between maintaining stability and promoting democracy,” and this is despite what he earlier cautioned about trying to export democracy. What would that middle course look like? “first destroy existing terrorist groups and then attack the underlying conditions that breed them: the lack of basic sanitation, health care, education, jobs, a free press, fair courts.” It is not clear why he believes that a well-functioning civil society would trump the vision of a seventh century caliphate. Does he think that terrorists are people frustrated at not having running hot water in their houses? He says “If we do not do the right thing to improve life in the Muslim world, the terrorists will step in and do the wrong thing,” a snappy sentence, but not one that connects with the theology and ideology of terrorism he emphasized earlier. Again without saying where he would find the money, Huckabee asserts that he will increase our military budget by 50% and stop using troops for nation building, instead using other (unspecified) government agencies to build schools, hospitals, and sewage treatment plants. He suggests that we should have sent 450,000 troops into Iraq, rather than the “light” army we did send. He will not withdraw troops from Iraq, but rather stay the course until General Patraeus tells him what to do. That sounds pretty naïve to me. What about the political point of the whole invasion? Are the generals suddenly in charge of foreign policy too? Huckabee’s statement sounds like he sees the situation in Iraq in purely military terms, another very naïve point of view. Huckabee quotes the administration’s standard slippery slope argument against withdrawal from Iraq. “Today, we face the dramatic downside: Iraq's centrality makes the country the perfect place for terrorists to create anarchy and have it spread. Those who say that we do not owe the Iraqis anything more are ignoring what we owe our own children and grandchildren in terms of security.” The same thing was said about Vietnam, but the sky did not fall then. He supports the recent Turkish invasions into northern Iraq and chastises the Bush administration for not having encouraged them earlier. Again, this presents a gun-toting commander in chief without a wisp of nuance. Havent' we already endured one of those? What if the Kurds start attacking American troops in retaliation now? That seems like a very high risk situation Wouldn’t it have been better for the US to route the PKK from Iraq itself? Or arm the Kurds to do it themselves, which they would, if, as Huckabee says, the PKK has little support among Kurds. Huckabee rattles his saber at Iran, accusing them, without evidence, of being in cahoots with al Qaeda. He wisely cautions against war with Iran however, arguing instead that they should be “contained” with economic sanctions supported by Europe. He welcomes the administration's declaration of Iran’s Revolutionary Guards as proliferators of WMDs and their armed forces as supporters of terrorism. He does not say how this bellicosity is helpful in any way, but claims that Democrats who object to it are deluded because “these moves are an attempt to use economic power instead of, not as a prelude to, using military power.” I’m afraid the logic there escapes me. Huckabee would enthusiastically go forward with putting missile interceptor cites in Poland and the Czech Republic, as a defense against Iranian aggression. With stunning self-blindness, he blows off “Putin’s” objections as mere jingoism. Again I am left with a chilling question of whether this essay is theatrical posturing or genuine naivety. Huckabee would reestablish diplomatic ties with Iran, but only if they make “concessions that serve to create a less hostile relationship.” Does that sound like the top high school student who is generous to others? In Pakistan, “tough love” is called for. What is that? It seems to mean that we should just go ahead and invade the Northwest territories where al Qaeda is hiding. The next terrorist attack on the US will come out of Pakistan, Huckabee asserts. Wouldn’t it be rather foolish to invade Pakistan, one wonders? Have we learned nothing? Not to worry, Huckabee assures us, “The threat of an attack on us is far graver than the risk that a quick and limited strike against al Qaeda would bring extremists to power in Pakistan.” That must have been an echo; I couldn’t have really heard that. His more sensible Pakistan policy is to put some accounting controls on the billions of dollars of untracked foreign aid that we give Pakistan in an attempt to buy its loyalty, if not its acquiescence. Staring down evil (should you be able to truly identify it) is no doubt an admirable passtime, but I would be horrified by Huckabee’s over the top bellicosity if I believed a word of it. On the other hand, there is little or no mention of many of the other grave international threats facing our country, such as pandemics, nuclear proliferation, economic globalization, climate change, and many, many others., nor consideration of the roles of NATO and the UN, or the strategic use of foreign aid. The goal here was to rattle the saber and the saber has been duly rattled. I simply do not believe the American people are stupid enough to go take this message seriously.